Christmas Day Christmas is a religious holiday which symbolizes the birth of Jesus Christ. 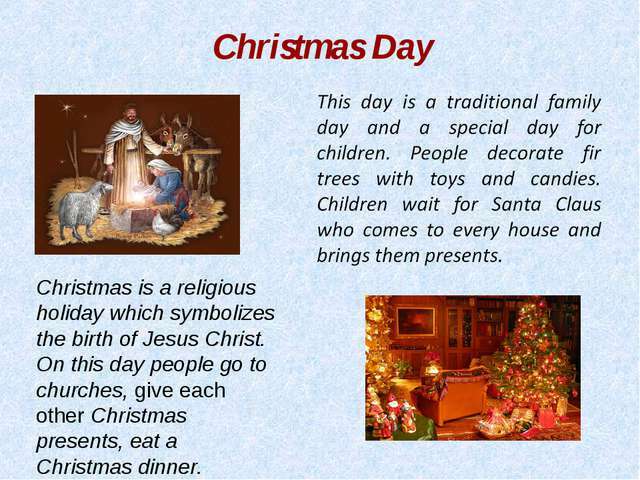 On this day people go to churches, give each other Christmas presents, eat a Christmas dinner. Christmas dinner In the 19th century goose was the traditional meal at Christmas. 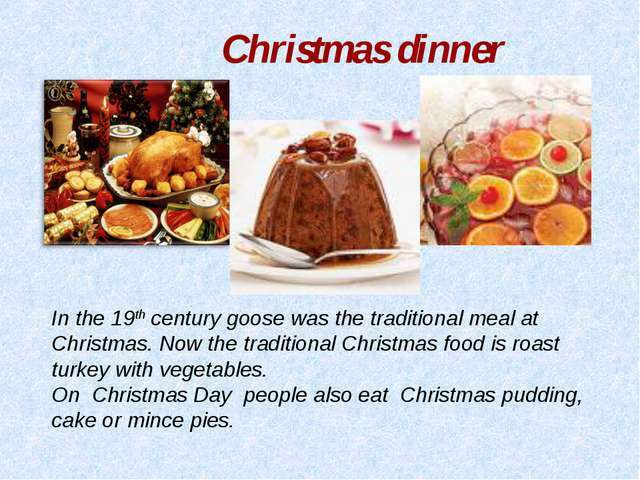 Now the traditional Christmas food is roast turkey with vegetables. 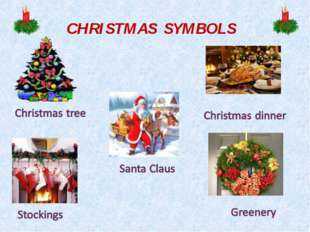 On Christmas Day people also eat Christmas pudding, cake or mince pies. Greenery People in Great Britain usually decorate their houses with holly, Ivy and mistletoe. 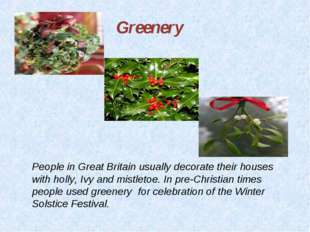 In pre-Christian times people used greenery for celebration of the Winter Solstice Festival. 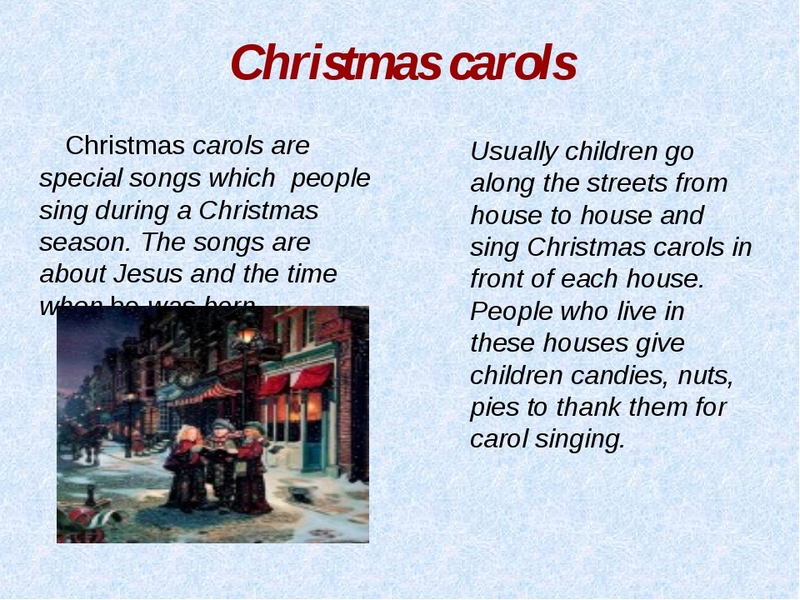 Christmas carols Usually children go along the streets from house to house and sing Christmas carols in front of each house. 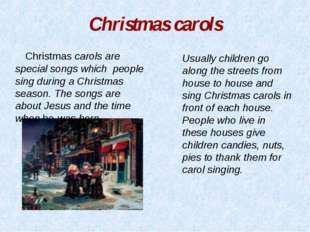 People who live in these houses give children candies, nuts, pies to thank them for carol singing. Christmas carols are special songs which people sing during а Christmas season. The songs are about Jesus and the time when he was born. Santa Claus got his name from St. Nicolas, a man who lived in the 4th century. 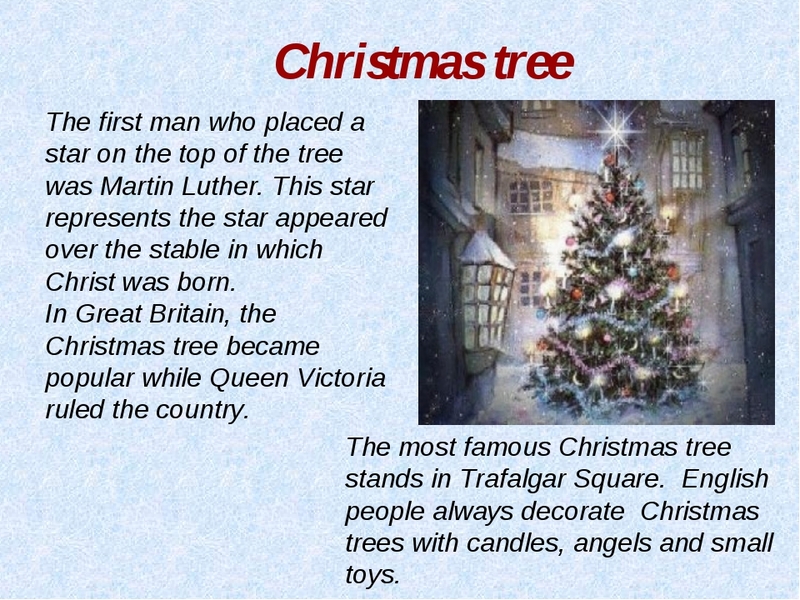 He gave his wealth to the poor and often to children. 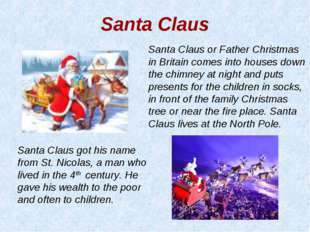 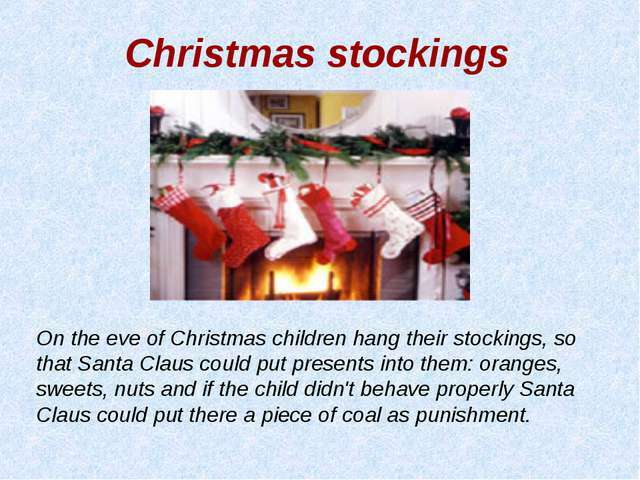 Santa Claus Santa Claus or Father Christmas in Britain comes into houses down the chimney at night and puts presents for the children in socks, in front of the family Christmas tree or near the fire place. 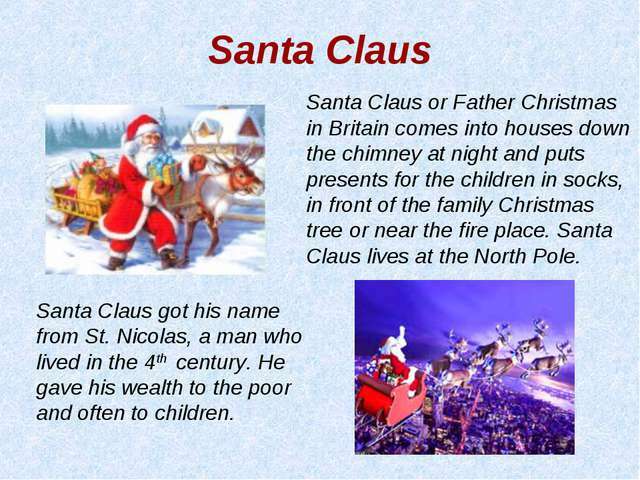 Santa Claus lives at the North Pole. 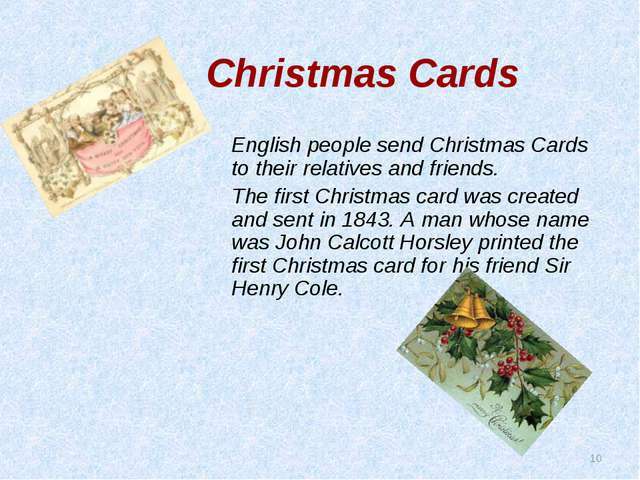 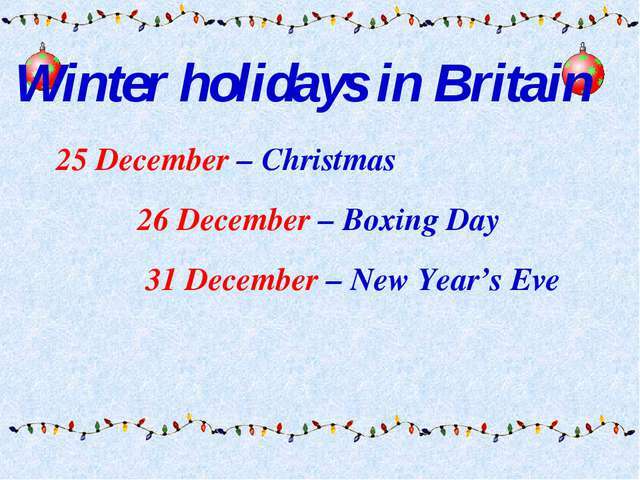 * Boxing Day English people celebrate Boxing Day on December 26th. 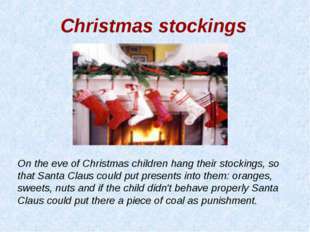 It comes after Christmas Day. This is an old tradition, when in old times rich people gave their servants money or “Christmas boxes”. Nowdays it is the day when people simply have rest, go shopping and visit their friends. 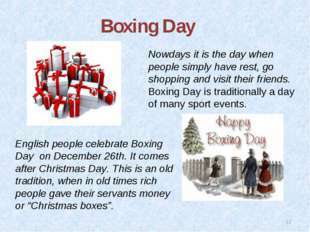 Boxing Day is traditionally a day of many sport events. 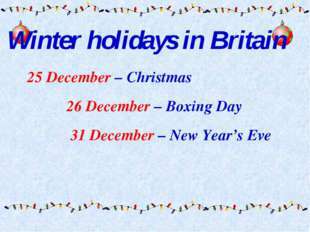 On New Year’s Eve many people get together with their relatives and friends or go to parties. They wait for midnight to see the New Year in. 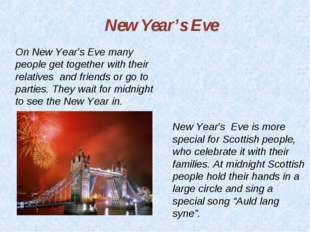 New Year’s Eve New Year’s Eve is more special for Scottish people, who celebrate it with their families. 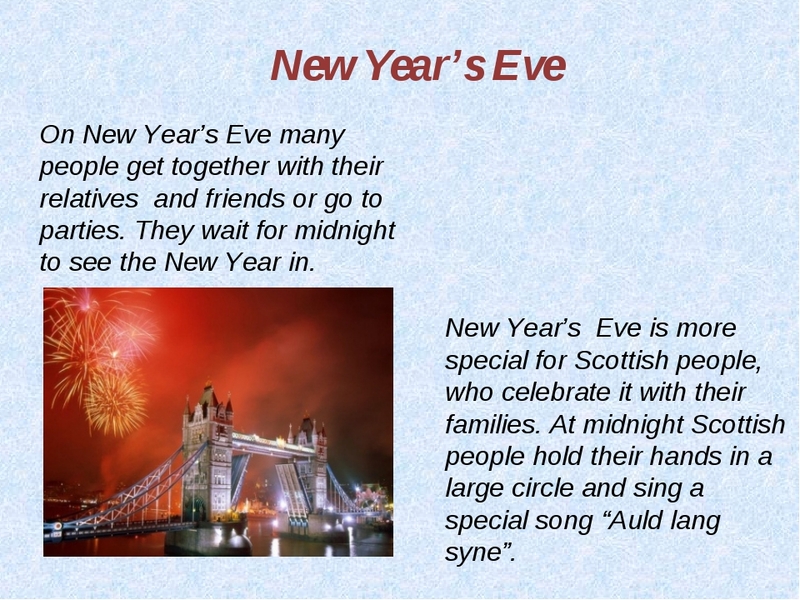 At midnight Scottish people hold their hands in a large circle and sing a special song “Auld lang syne”. 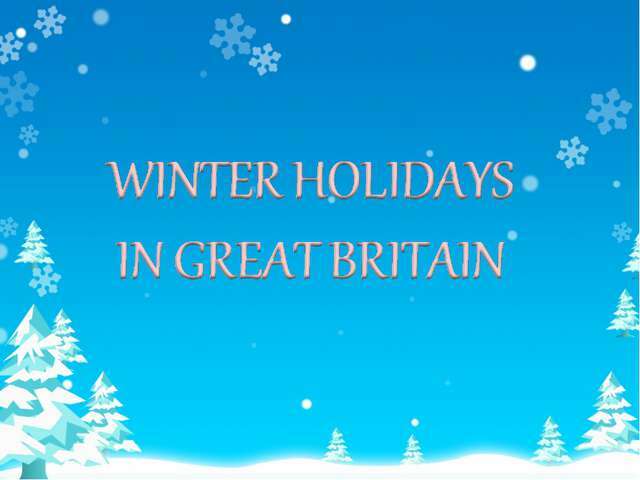 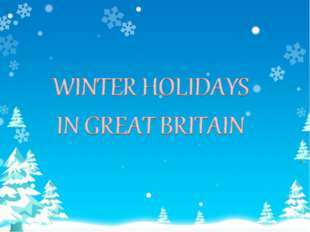 * New Year’s Celebrations In Britain people make New Year’s resolutions. They promise themselves that they will improve their behavior and give up bad habits. In London people gather to celebrate in Trafalgar Square. When Big Ben begins to strike they all start to greet each other with ‘Happy New Year’. 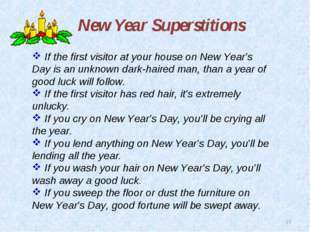 * New Year Superstitions If the first visitor at your house on New Year’s Day is an unknown dark-haired man, than a year of good luck will follow. If the first visitor has red hair, it’s extremely unlucky. 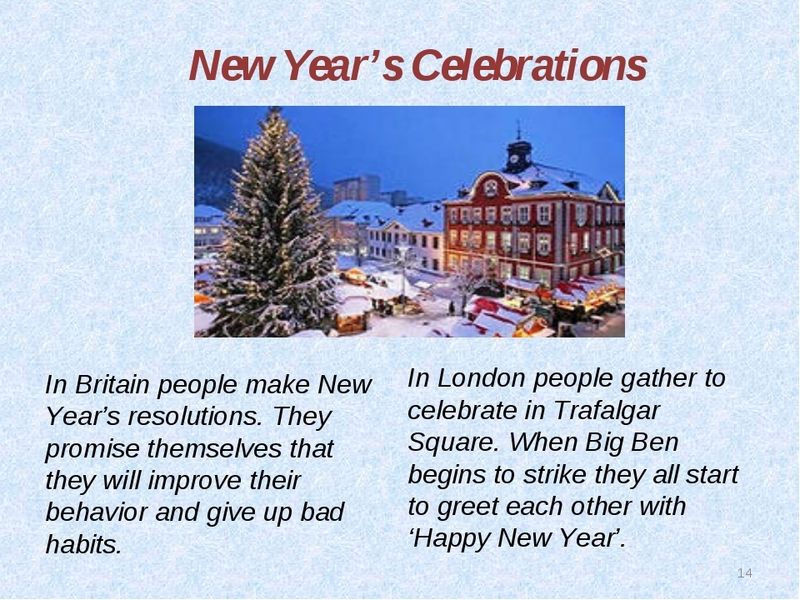 If you cry on New Year’s Day, you’ll be crying all the year. 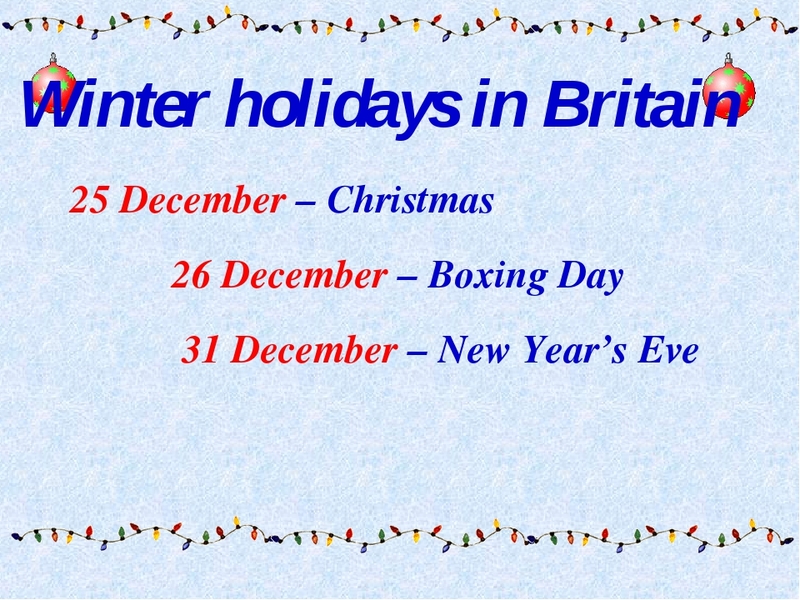 If you lend anything on New Year’s Day, you’ll be lending all the year. If you wash your hair on New Year’s Day, you’ll wash away a good luck. 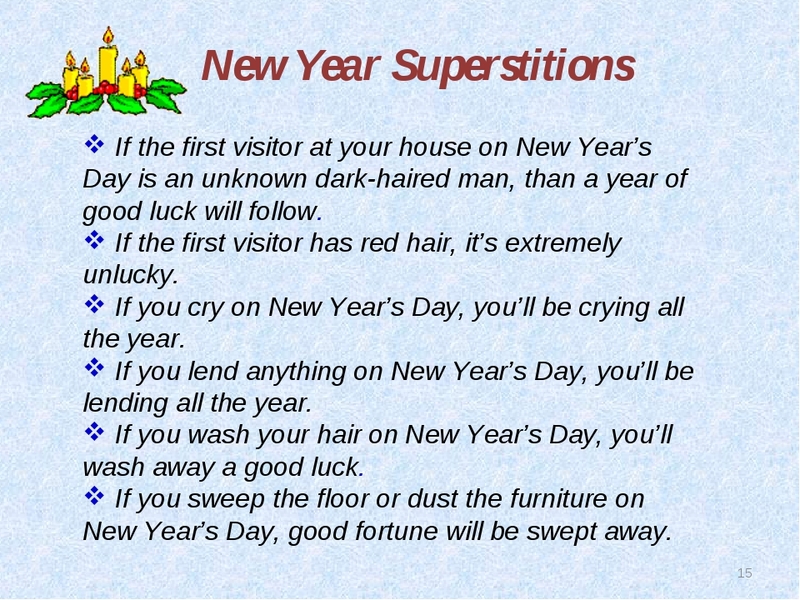 If you sweep the floor or dust the furniture on New Year’s Day, good fortune will be swept away. Презентация познакомит учащихся с традициями празднования Рождества и Нового года в Великобритании. Презентация содержит красочные картинки и анимацию. 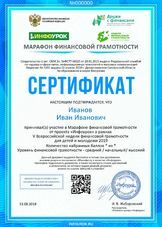 Презентация может быть использована как на уроке по темам: «Праздники. 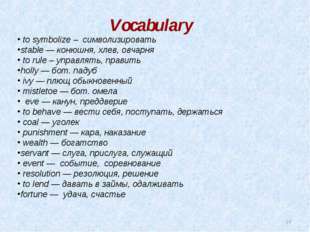 Рождество. 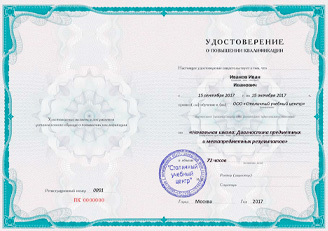 Новый год. 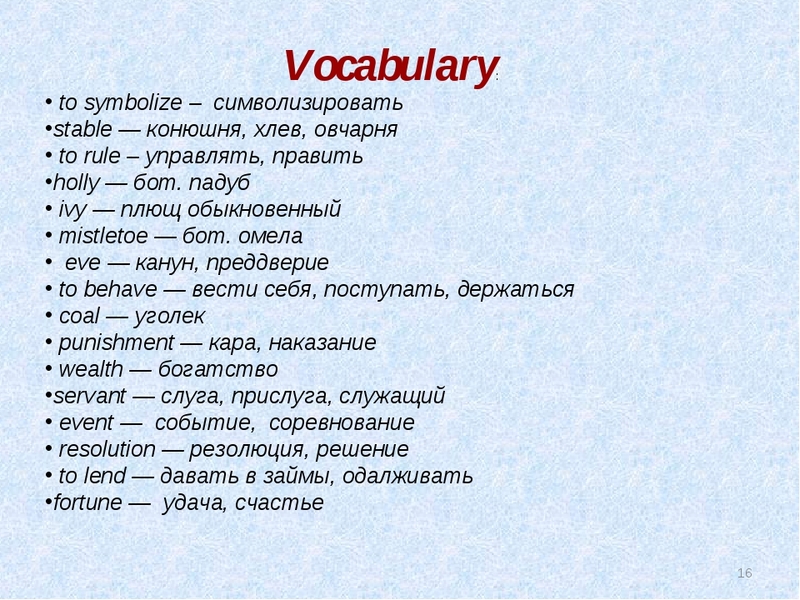 День подарков», так и во внеурочной деятельности по предмету. 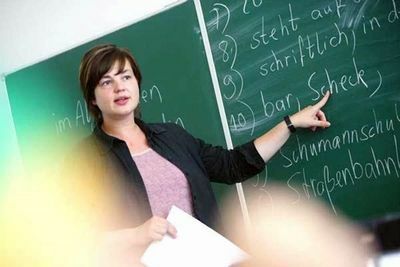 Цели: ознакомление учащихся 4 классов с традициями празднования рождества и нового года в Великобритании; формирование интереса к изучению английского языка как средства знакомства с традициями англоязычных стран. 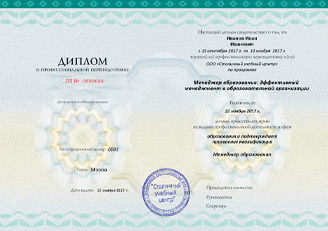 Презентация может использоваться учителями английского языка, работающими по любому УМК, при изучении темы British holidays. 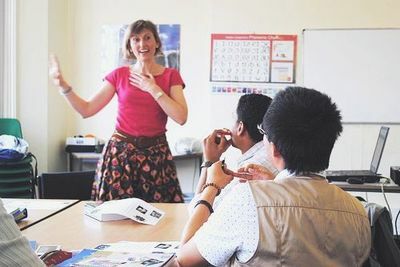 Урок английского языка по теме «Город» в 4 классе по УМК «English 4» Кузовлев В.П.